Come and discover how you can make your Dairy Farm more sustainable at this FREE and unique event to be held at a working dairy farm, in Staffordshire. Government funding means a Biolectric slurry only micro anaerobic digester plant could be cash positive from year 1, so don’t miss this unique opportunity to make money from your slurry! Come and discover how you can make your Dairy Farm more sustainable at this free and unique event to be held at a working dairy farm (location to be confirmed). 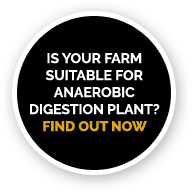 Government funding means a Biolectric slurry only micro anaerobic digester plant could be cash positive from year 1, so don’t miss this unique opportunity to make money from your slurry!